Slotastic Casino has just had a big jackpot winner on one of the most popular RTG slots that it offers to players around the world. 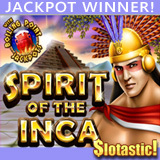 David J, a VIP player, won $146,088 jackpot playing Spirit of the Inca. He says he’ll pay off some bills with his winnings but he’ll also use at least some of the money to treat himself to a little personal indulgence, a new truck. Spirit of the Inca is one of the first games from Realtime Gaming with the unique Boiling Point jackpot feature. It lets players know just how close each of the four networked jackpots may be to being hit. Although Slotastic caters to slots players, it also offers a complete selection of table games like Blackjack, Baccarat, Craps and Roulette. Watch for a new look the casino says it will unveil later this month.